Most Bay Area hate crime victims were targeted because of their race. According to data collected by the FBI, several East Bay cities saw large increases in reported hate crimes in 2016. Topping the regional list was San Leandro, where the police reported 22 hate crimes. 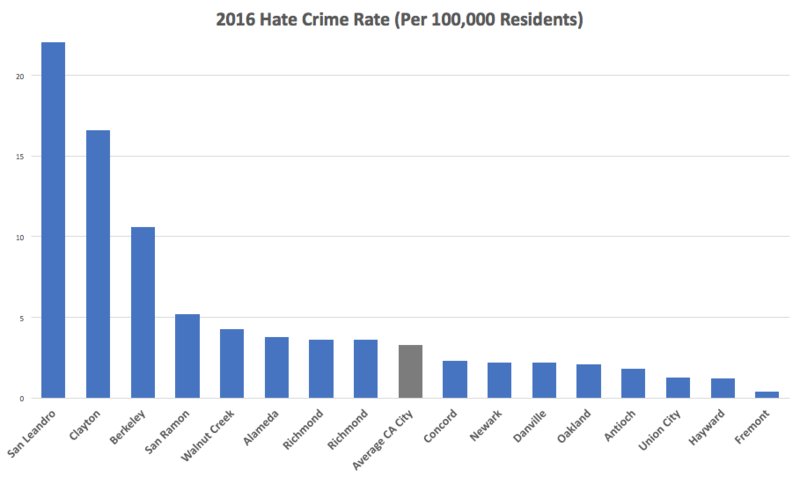 This gave the East Bay city of 91,000 residents the third highest hate crime rate of any city in the state: 24 crimes per 100,000 people. Fifteen of the hate crimes committed in San Leandro last year were racially motivated. Berkeley also saw a sharp rise in hate crimes, with 13 incidents, nine of which were racially motivated. Berkeley, which has a population of 122,000, had an overall hate crime rate of 11 per 100,000. Berkeley's rate was more than three times as high as the average for cities in California. The average rate was 3.3 per 100,000 residents last year. Berkeley Mayor Jesse Arreguin called the FBI's hate crimes report alarming and linked the rise in incidents to the current political climate. "When a presidential candidate openly vilifies immigrants, Muslims, Latinos, women, and the LGBT community, and empowers bigotry and hatred, it’s not surprising that people will act out in their hate," said Arreguin. "Several of these hate crimes occurred after the election in Berkeley against Muslim Americans, and businesses and individuals of all backgrounds have been the target of harassment." In previous years, both Berkeley and San Leandro had rates much closer to the state's average. San Leandro Police Chief Jeff Tudor said he's reviewed the FBI's report as well as specific incident reports written by his own officers to more fully understand what's behind the rise in reported hate crimes in his city. But he said part of the reason San Leandro may have ranked so high this year is that his officers are told to classify incidents as hate crimes in cases that may not initially have been motivated by bigotry, but which involved a racial slur, misogynist comment, or homophobic remark. Other police department's may not be this attentive in classifying incidents as hate crimes under the FBI's system. "I think our officers and sergeants erred on the side of caution," said Tudor. "But I want to make it perfectly clear we will always document and look into cases where an incident involves a hate crime or involves hate speech." It's widely acknowledged that the FBI's system of tracking hate crimes needs improvement. In fact, many police departments choose not to send data to the FBI each year, because data reporting is voluntary. And what's classified as a hate crime is up to each local police department. Furthermore, many victims are hesitant to report a hate crime to the police. Even so, the yearly report provides a look at patterns in hate crimes throughout the country. In Northern California, several cities consistently rank high on the FBI's list. Santa Cruz, which has a population of 65,000, ranked sixth in the state in 2016, with 12 reported hate crimes and a rate of 19 per 100,000 residents. Seven of these hate crimes involved racial bias; three, religious bigotry; and two, because of a person's sexual orientation. In 2014 and 2015, Santa Cruz's hate crimes rate was lower, but still three to four times the state average. The small Mendocino city of Fort Bragg — named after a Confederate Army officer — topped the state rankings this year with a hate crimes rate of 41. In 2014 and 2015, Fort Bragg's hate crimes rate was also several times higher than the state average. But the city's small population, just 7,200 residents, means that just one extra hate crime per year can bump it's rate up by 13 points, making comparison with larger cities difficult. The FBI's full 2016 hate crimes report can be accessed here.